Two man earth auger well balanced with heavy duty handle bars. Time tested transmission,efficient,worm drive transmission with high quality Timken roller bearings and heavy duty industrial cog-type drive belt. Transmission output shaft is 7/8 inch square auger drive. Centrifugal clutch with all metal shoes and drum with needle bearings. Trigger-type return style throttle, with a stop switch on handle bars at both operator positions. 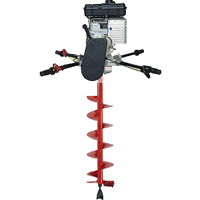 Easily diggs with a 12 diameter auger, and will handle the hardest soils. Briggs and Stratton and Honda engine options available. Auger speed is 180 rpm@3600 engne rpm (no load. Approximately 150 ft lbs. of torque.